Happy Labor Day & A Great Product Giveaway! I hope you all had a great summer. Now that summer is coming to an end and back to school lunches and snacks are on our minds, I thought I'd share a great product I found. This product is great for adults and kids. To fill you all in a little, I've been thinking a lot about what water we should be using in our house, bottled, filtered, alkaline, etc. I tried alkaline bottled water but was not happy about it being packaged in plastic. I tried filtering my tap water but I felt it wasn't removing all the chemicals it should. Then I found Phountain Water. You can fill up your glass gallon containers and choose what alkalinity you want. I use an 8.5. Their filters remove all chemicals and you are getting clean filtered, alkaline water, in glass bottles. I am happy! Now back to my amazing product find. While in there filling my water gallons, I saw these bars from Nature's Fuel. They had samples to try and I fell in love with them. The nutrition is amazing and so is the clean ingredient list. They have 8 grams of fiber, 18 grams of protein, are gluten, dairy, soy free and vegan. The flavors are also incredible and will satisfy all the junk food cravings you will have like (almond joy, jelly ring, smores, girls scout samoas). Believe me I've been eyeing jelly rings at Trader Joes for a couple of months now and would not give in. Then I had the jelly ring bar and it completely satisfied my craving! My daughter was with me when we sampled them and has been addicted to them too! I will be cutting these in half and giving them to my daughter for a snack at school. It feels like such a treat to her, but I feel good that I'm giving her a healthy snack. Also, the jelly ring flavor has greens in it too! You can purchase these bars at any Phountain Water location or at the outside market at Jericho Whole Foods (if your in the Long Island, NY area) throughout September and October. 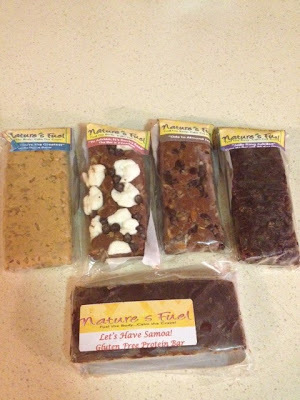 Serafina the owner of NatureGirl Industries was nice enough to give 12 bars (your choice of flavors) to one of my readers!! Just enter using our Rafflecoptor giveaway box. The contest will be closing on Saturday 9/14/13, so hurry and enter! The winner will be chosen at random.